One of the things I am so excited for in my life is to re-do a kitchen, honestly I think about it all the time ! I hope the house we eventually buy has a horrid kitchen so I can rip it out and start fresh. 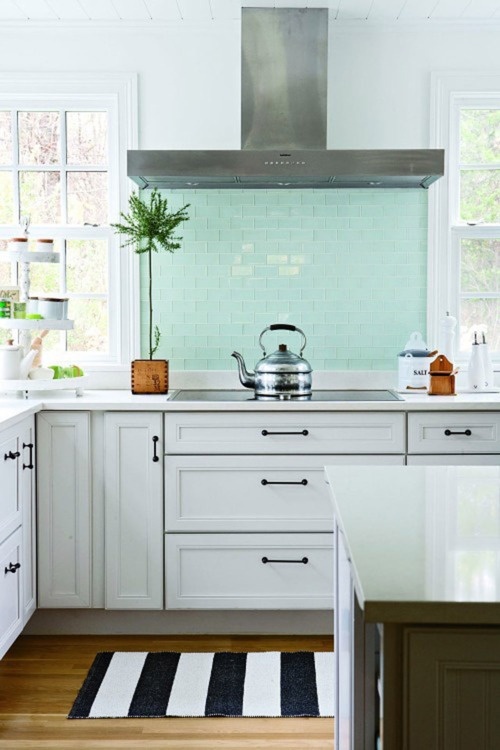 I dream of carrara marble countertops, white cabinets, pendant lights, bamboo shades, open shelving, brizo faucets, and most recently, a turquoise blue glass subway tile backsplash. 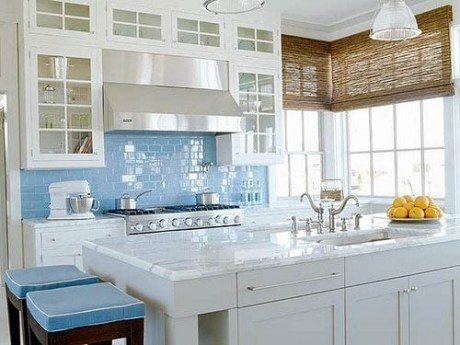 What do you think of blue glass subway tiles?? P.S. Don't forget to enter the Ex Voto wrap bracelet giveaway - winner will be chosen tomorrow! P.P.S. Tomorrow at midnight is the cut off for the Endless Summer Photo Contest!! 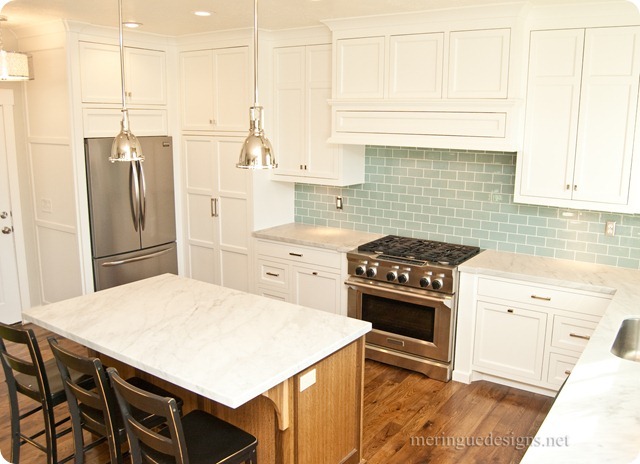 I would re-think the carrara marble countertops and go with something more eco friendly like Silstone or even quartz. Carrara marble may be pretty but it is oh-so-porous and soft so every stain and every scratch will show. Not to mention it reminds me of a froo-froo ladies toilet just waiting for something pink and feathery to match. Go eco. Go friendly. And glass tiles would be a better choice than subway as the light bouncing off is just amazing. Also flooring - think cork, quaint linoleum for a retro look. 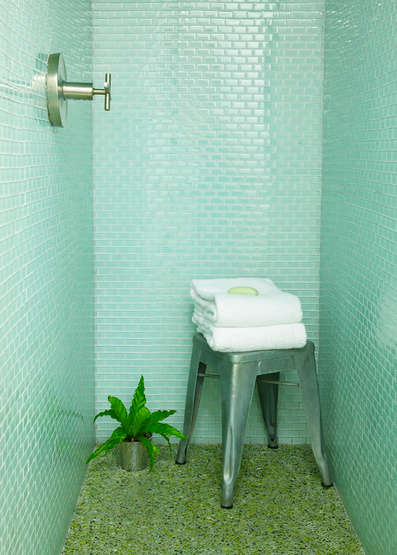 Stone tiles from Mexico that have been hand created are cool but pricey. Get a good contractor, plan to spend three times more than you thought and at least twice the time to complete. Then sit back and plan your next project! My two cents. I have been there. 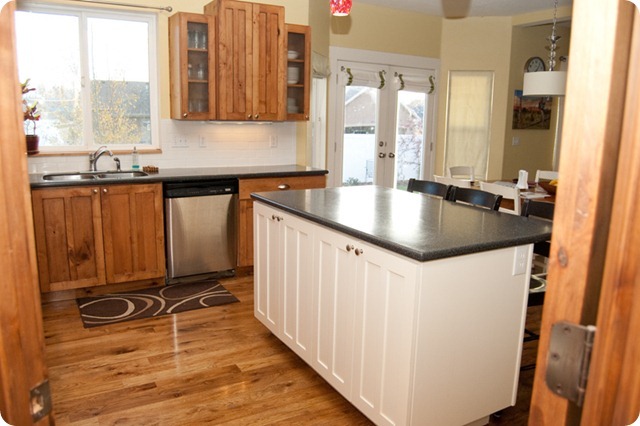 Just remember - every kitchen remodel starts off with good intentions but it is, after all, just a place to store stuff. 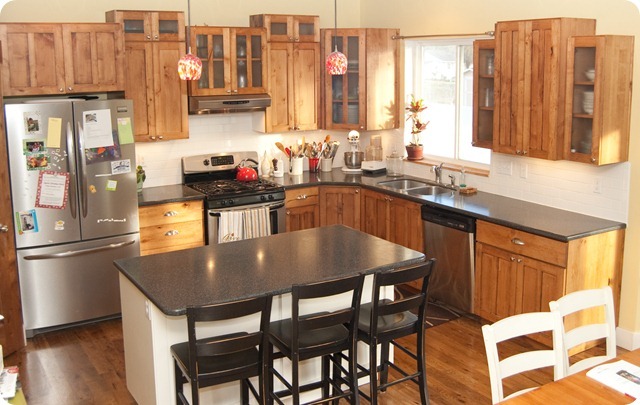 I work in real estate and lately, the trend I see in my high end resort town, are buyers saying they need to re-do the kitchen that was just redone in 2006. Tuscany is over and my buyers are pulling out the cheap everybody-has-it-now granite and donating their stainless steel appliances to Goodwill. 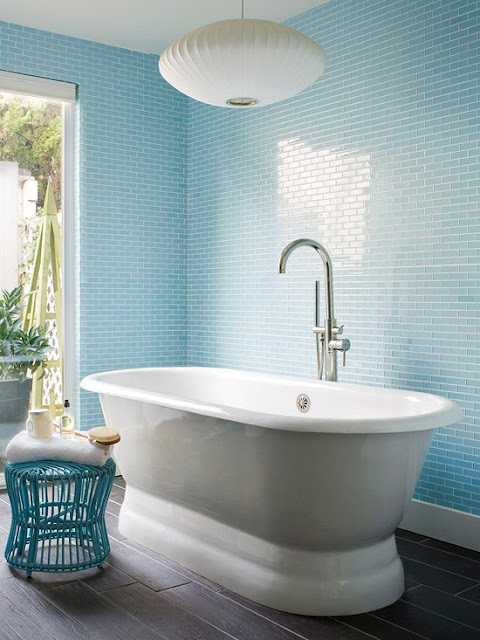 Retro, cool colors, eco friendly sustainable living is in vogue. And who knows what the next 5 - 10 years will be? 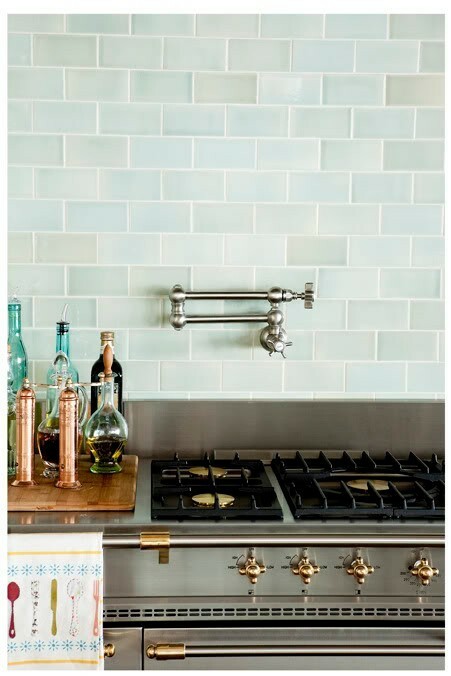 Couldn't agree with you more on this issue :) Blue subway tile is just a little bit of perfection. 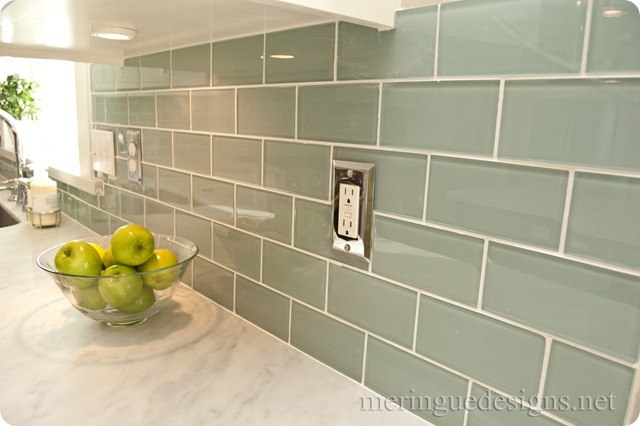 Gorgeous greens & blues subway tiles you showcased; and the redo is fabulous!!! 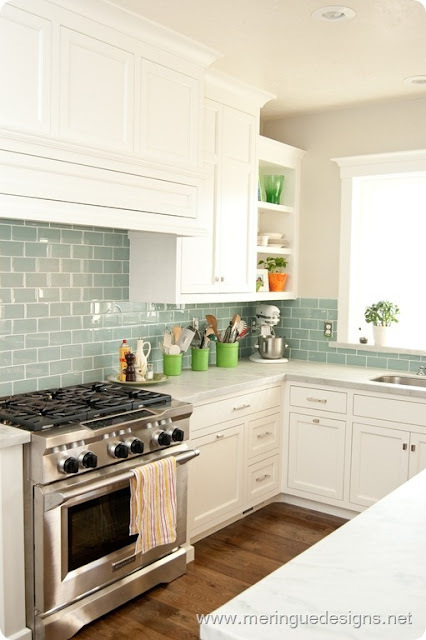 The blue subway tiles are a great pop of color in a white kitchen. Great post. 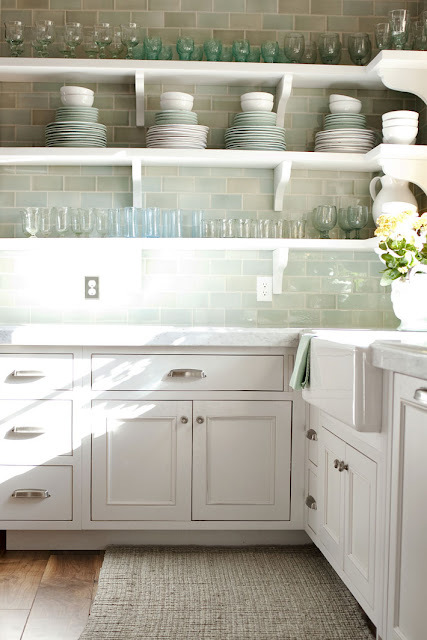 Absolutely LOVE blue subway tiles! I've got creamy white painted cabinets and pale yellow walls, but have been leaning towards painting my walls a soft aqua like these tiles. I love the second photo with the subway tile. That color is gorgeous. I love blue glass subway tile, too. I re-did my kitchen last year with white cabinets and a blue glass subway tile back splash. I did a lot of research and found the same pictures that you have in this blog. My countertops are a sandy colored granite. I love the look of my new kitchen! Love the beach blue/greens with the white. Very nice. These are gorgeous! 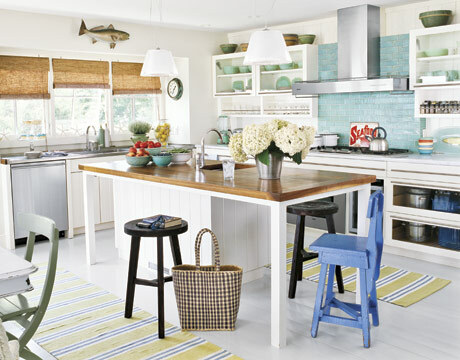 Where did you find the picture of the kitchen with the red/white crab sign on the stove. 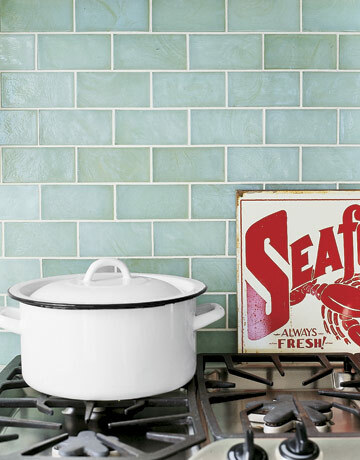 Those tiles are stunning - almost a sea green mother of pearl? Would love to know where to find them!